Flying across the Atlantic to California for a vacation in 1978, Huguette, a petite and pretty Parisian woman, desired a traditional croissant and café au lait. Fortunately, a kind soul directed her to one of the only French café’s in Los Angeles, Michel Richard’s on Robertson and Third. Her life changed forever as she developed a serendipitous connection with the French pastry chef. Their friendship blossomed, due to her love for his authentic cooking. Whenever she arrived in Los Angeles, she always made a trip to Richard’s. On one visit, Richard invited her to move to Los Angeles and work with him in his restaurant. She accepted his invitation and became proficient in every task at the café. In 1984 a young and handsome Frenchman, Thierry Hennequin was on his way to Australia from France. He decided to see some the sights in Los Angeles during a stopover, and wandered into Michel Richard. Thierry never made it to Sydney. Instead he stayed in Los Angeles, worked at Michel Richard, and later married Huguette. Michel Richard taught them both all of his secret recipes to make his famous pastries, preparing them to one day take over his successful café, so he could open Citrus on Melrose near Highland. The restaurant is not pretentious; it’s a comfortable and casual garden café that serves bona fide French cuisine for breakfast, lunch and dinner. Guests can bring their dog, as if in Paris, and sit at the outside patio with a pond filled with brightly orange fish. I was eager to bring my husband to Maison Richard last Saturday night. He adores French food and pastries. Unfortunately, he is usually disappointed with most of the “French” bakeries and cafes in Southern California. His palate can distinguish an authentic Napoleon, raisin roll and apricot tart. While sipping my kir royal, I noticed guests speaking French with a sprinkling of English on the garden patio. Also a warm smile and kiss on each cheek was a popular greeting. 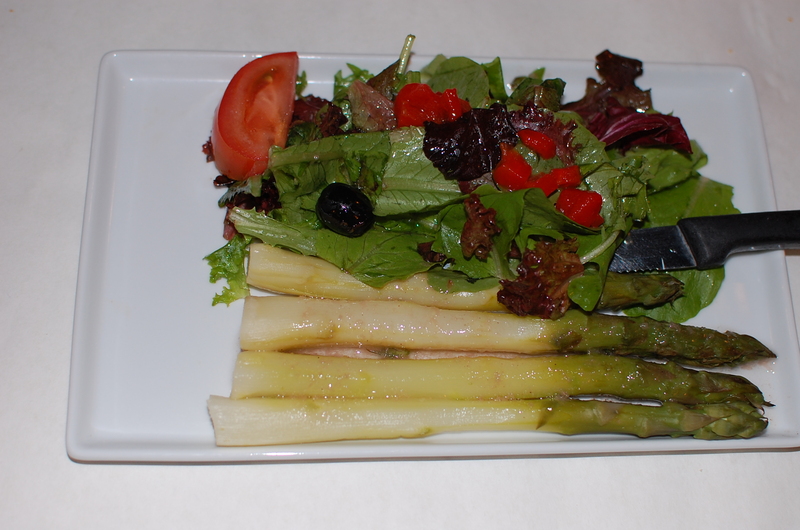 We ordered the asparagus salad with chubby and long light green stalks next to a bed of baby greens and tomatoes in a pure vinaigrette dressing. The salmon arrived with a red tomato Provencale sauce and a zucchini, tomato and potato gratin next to freshly cooked green beans with a hint of garlic. We also selected the Salade Nicoise with tuna, potato cubes, thinly sliced sweet onions, string beans, tomatoes, olives and anchovies on a bed of greens and a subtle vinaigrette dressing. It brought back fond memories of our recent trip to Cannes. 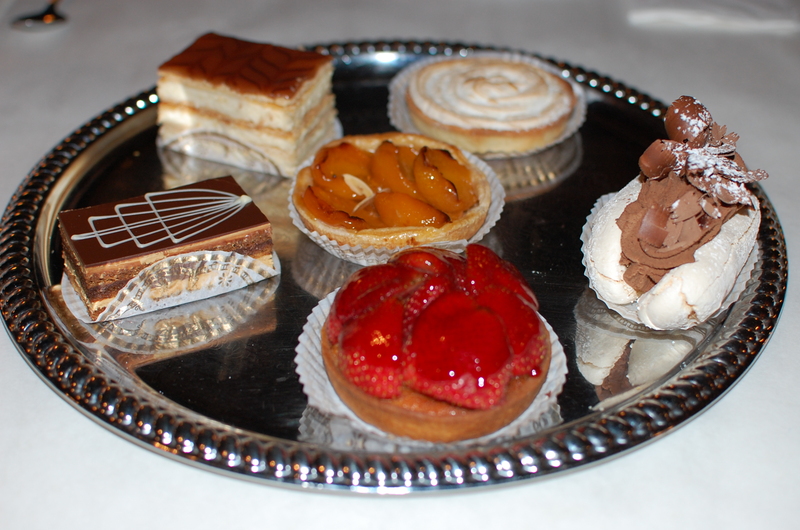 For dessert, we sampled six different pastries. For my husband this was the true test if he would return again. We started with a bite of the opera cake filled with espresso and real French chocolate. My husband was very pleased. Next, we bit into a Napoleon with its layers of flaky puff pastry custard and caramel. I pierced a sweet bright red strawberry from a tart and popped it into my mouth, then cut into the almond paste crust. Pure joy! The lemon tart filled with luscious lemon cream and meringue was heavenly. As we said goodbye, I was in such a jubilant mood that I shook Thierry and Huguette’s hand and then kissed them on each cheek. Finally, we have a French café close to us that we can frequent often when we yearn for true French hospitality, food, and sweet treats. This coming Saturday, visit Maison Richard between 10am to 4pm or while supplies last, for a free sample of their famous pumpkin pie. This is not a traditional pumpkin pie. This pie has a roasted hazelnut crust, then a layer of pumpkin mousse, and a thin coating of whipped cream. It’s decorated with walnuts, whipped cream flowers. and topped with a chocolate medallion. via A True Taste of Paris.